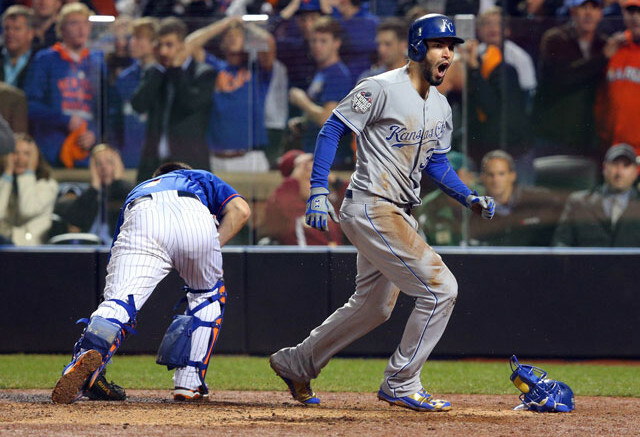 Eric Hosmer and the Royals benefitted from a Mets meltdown in Game 5. What came first, the choking or the egg? The New York Mets fell apart against a Kansas City Royals team that evolved from a complete rebirth, and hats off for overcoming the pain of losing Game 7 in heartbreaking fashion last October against the San Francisco Bumgarners. If I learned anything from the 2015 World Series, it’s that I probably learned very little. Instead, I was simply re-reminded that there are only a very special brand of teams that end up winning it all. The Royals are one of those rare breeds, but as the Beatles would say, they got by with a little help from their friends (the Mets). After watching the Giants win every other year, it is obvious that it takes a group of “grinders,” a collection of 25 mentally tough individuals all capable of making their own contributions at any given moment. A potent offense doesn’t win; rather, a relentless one does. A dominant starting rotation doesn’t win; rather, an efficient and unselfish one does. And a lights-out closer doesn’t win; rather, an entire bullpen that can bridge the gap to him does. This isn’t news. But the Royals’ nightly dramatic comebacks also highlighted what has become my own personal Yogi Berra-ism: “50 percent of winning is the other team losing.” Enter the New York Mets. In the spirit of Isaac Newton’s law of “for every action there is an equal reaction,” the Mets made sure to counter every uptick by K.C. with a mind-numbing blunder of their own. Where do we start? How about Game 1. First, it looked as if the Royals might have angered the baseball gods when Eric Hosmer’s error gave New York a 4-3 lead (this after the gods were beaming with pride on Alcides Escobar’s leadoff inside-the-park home run). That lights-out closer for the Mets came in to escape an eighth inning jam, but Jeurys Familia was not so lucky in the 9th. Alex Gordon rocked one over the wall in dead center to tie the score. Familia was removed after 12 pitches, and it was only a matter of time before the dam broke for good. In the bottom of the 14th, for those still awake to see it, the real-life version of Mr. Met, David Wright, who has waited his whole long career to get to this stage and endured a bout with spinal stenosis in 2015, booted a ground ball to open the frame. Three batters later, Hosmer got his redemption and walked Bartolo Colon (BARTOLO COLON?!?) and the Mets off with a sac fly. It was only one game, but really, it was the series. Game 2 turned out to be a runaway. Jacob deGrom lost it in the fourth, and the Mets got two hits. End of story. Game 3 was a 9-3 Mets win and provided hope, but it turned out to be false hope, because Games 4 and 5 saw the collar tighten on the Mets, and the lapses were fatal. Things started off rosy for the Mets in Game 4, but it was only 3-2 New York heading to the 8th. This is where you learned that not only do players choke, but so do managers. I should preface this by saying I have nothing but admiration for Terry Collins and have for years, constantly marveling at how hard his teams played despite never having the talent to match up to the league’s elite. But there is no sugarcoating the fact that Collins was vastly out-managed by his counterpart, Ned Yost, in this Fall Classic. Knowing deep in his heart that Familia was and is his only reliable reliever, Collins turned the game over to set-up man Tyler Clippard in the eighth after Addison Reed miraculously got through the seventh (more on Reed in a moment). Clippard retired Escobar, but walked Ben Zobrist. That’s when Collins should have put Familia in, if not at the beginning of the frame. Instead, he watched as Clippard walked Lorenzo Cain before pitting Familia against Hosmer. Familia in fact made the pitch he needed to, but was let down by NLCS-hero-turned-World-Series-dud Daniel Murphy, who botched an easy ground ball that allowed Zobrist to score the tying run. Mike Moustakas administered the final dagger with a go-ahead RBI single, then series MVP Salvador Perez added an insurance run that the Royals wouldn’t even need at that point one hitter later. Even after Murphy’s error, Familia could have gotten out of it, but didn’t. The team had lost focus, which was evident simply watching Familia’s pickoff attempt to first base, which Lucas Duda dropped and nearly allowed that insurance run to score before it actually did. Duda had a chance to be the hero in the bottom of the ninth, but couldn’t come through. Fortunately, his goat status was revoked and given instead to Yoenis Cespedes, who inexplicably was doubled off first base on a soft line drive to end the game. What made this exponentially worse was the fact that while Cespedes represented the tying run, he was in fact the trail runner, meaning he never should have been that close to Murphy down at second. This reminded me a little bit of Kolten Wong getting picked off first base to end Game 4 of the 2013 World Series with his team down 4-2 and the tying run at the plate. Cespedes was not in tears afterwards as Wong was, but he will feel this one for a while. The Dark Knight could have risen and sent the series back to Kansas City in Game 5, but after eight shutout innings, we all learned another valuable lesson, and Collins learned it the hard way – players should play, and managers should manage, never the other way around. Harvey wanted desperately to finish what he started, and one cannot fault Collins for at least giving his ace a chance to start off the frame clean before calling on Familia. Harvey walked Cain, and that should have been that. Instead, Collins left Harvey in to give up a run-scoring double to Hosmer, and Familia’s job suddenly became darn-near impossible. Familia retired Alex Gordon, but as he has become so adept at doing, Gordon was able to move Hosmer to third with less than two outs. Familia needed to make a brilliant pitch to Perez to keep Hosmer stationary, and he did. But once again, his defense let him down. This time, Wright cut in front of Wilmer Flores to field Perez’s soft grounder, firing to first for the out. Hosmer alertly raced home, and Duda could not make an accurate throw to catcher Travis d’Arnaud, another costly mistake as Hosmer dove in safely with the tying run. At this point, you could’ve already started writing the Mets’ eulogy, even as they had another chance (and then two more) to break the tie and win the game. Enter Reed, who left no mystery as to why the bottom-feeding Arizona Diamondbacks and Chicago White Sox gave up on him after failed closer stints. Forgot for a second, if you can, that Reed’s final line in Game 5 read one-third of an inning, four earned runs, and a big fat ‘L’ on his ledger. Watching Reed pitch was simply painful, because his body language reeked of fear and insecurity. That is nothing to be ashamed of, but nothing to warrant pitching in a spot that big, either. Reed throws hard (so what? ), but missed his spots on nearly every critical pitch. His mechanics have always been a little shaky, but the true mark of a pitcher that just doesn’t have what it takes is the inability to put hitters away. Mets fans got an unfortunate glimpse of this in Game 2 of the NLDS, when Reed left a fat, 0-2 fastball over the heart of the plate that Adrian Gonzalez ripped for a go-ahead and game-winning RBI double. This time around, Reed jumped ahead of Christian Colon, in his first at-bat of the entire postseason, 0-2. Once again, Reed tensed up, and two pitches later, overthrew one and left it out over the middle for Colon to lace into left for the final dagger. It’s fair to wonder why Clippard didn’t get the call, because even during a slightly-more-encouraging recent run by Reed, he has never been able to avoid giving up hard contact. That did not change in Game 5. Not surprisingly after Kansas City went ahead, Reed completely imploded, again missing badly on an RBI double by Escobar before Cain buried the Mets and ditched the shovel with a bases-clearing double off of Bartolo Colon. The Royals could do no wrong this postseason, similar to last year when they came 90 feet from tying Game 7 against the Giants. Down four runs in the eighth inning of an elimination game in Houston in the ALDS, they rallied to win 9-6. That, too, necessitated a choke by the Astros (more specifically, Will Harris). They coaxed three blown saves out of Familia after he blew just four all year in 47 chances. Three of their game-winning rallies in the Fall Classic were aided by New York errors, even if they didn’t technically show up in the box score as Duda’s didn’t. For turning around last year’s disappointment, Kansas City deserves the accolades, but let’s make sure not to forget the other side of things. Just because the Royals put pressure on teams by putting the ball in play and being aggressive on the basepaths, it doesn’t mean their opponents’ need to succumb to it. Unfortunately, the Mets did, and will look back on this 4-1 series loss as one that easily could have been a 4-1 series win. But good teams hang tough, and teams not worthy of a parade buckle. It is surprising to see this from the Mets after being a resilient team all year, but the seams came apart. In the end, the Royals won… but the Mets lost. More accurately, they choked. Be the first to comment on "World Series Recap: Mets Choke from Royal Pains"